Ghana U23 coach Yusif Abubakar has been reported dead this morning. The ex-Aduana Stars coach, 60, passed at his family home in Tech – Kumasi and is expected to be laid to rest this afternoon per Islamic requirements. He was the family head. “Yes, he was sick and we took him to hospital, they gave him treatment and we were directed to come home so he comes for periodical checks. His condition worsened this morning and he eventually passed away. He will be buried according to Islamic burial rites this afternoon at 2:00pm”. All events will go on at his residence at Tech Zongo, Kumasi. MOHAMMED MANSURU, son of the late coach confirmed the incident. Abubakar left Aduana Stars in July following the expiration of his contract. He was recently appointed head coach of Ghana’s Black Meteors and was tasked to prepare the Ghana Olympic team for their All African Games qualifier against Togo. He played in the CAF Champions League with Aduana Stars and managed Berekum Chelsea and giants Accra Hearts of Oak. 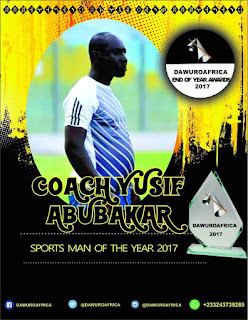 Coach Abubakar won DawuroAfrica's maiden edition of our end of year awards as he won the Sports Man Of the year after guiding Aduana stars win the Ghana Premier League.